When we read snippets of the scriptures here in church every week, we are at risk of not really knowing the full story. Or, perhaps the preacher decides to preach one week on the Hebrew Scriptures (as this preacher did last week), and then the next week dip into the gospel. This may be like turning into your favorite television series one week after missing a week or two, or for those of us who read to our our children at bedtime, you may be working through a beloved book, but your spouse did the bedtime reading the last two nights, and you are dipping into the story lacking the previous two chapters. You see, I could then preach an entire sermon about biblical interpretation, about the elders’ approach, and Jesus’ approach. However, I would be missing important context. What just happened before Matthew 21: 23? What just happened? What do you think? Thankfully, like most Episcopal Churches, we have removed the Bibles from the pews. So the question remains, what is going on in Matthew 21? If I told you that Matthew only has 28 chapters, what might you guess about chapter 21? He enters the city as a conquering hero, in the same style as the worldly powers such as the emperor. He cleanses the temple, calling out the corrupt “religious merchants” who were trying to profit off people’s religiosity. He healed the blind and the lame - specifically forbidden by the religious powers. When he saw a fig tree that was not producing, he cursed it...teaching them, and us, that faith like love, is an active verb, a way of life, and there should be fruits of faith that can be visible. So, when the “elders” question his authority, they are not merely questioning his scriptural interpretation, but questioning his activity, his overturning of political and religious corruption and hypocrisy, and forcefully cleansing the temple, and dramatically inspiring those who would listen to live out their faith. Jesus then turns the table on the questioners, and asks them “Did the baptism of John come from heaven, or was it of human origin?” They could not answer him. Encountering the religious hierarchy, he called into question their own authority. 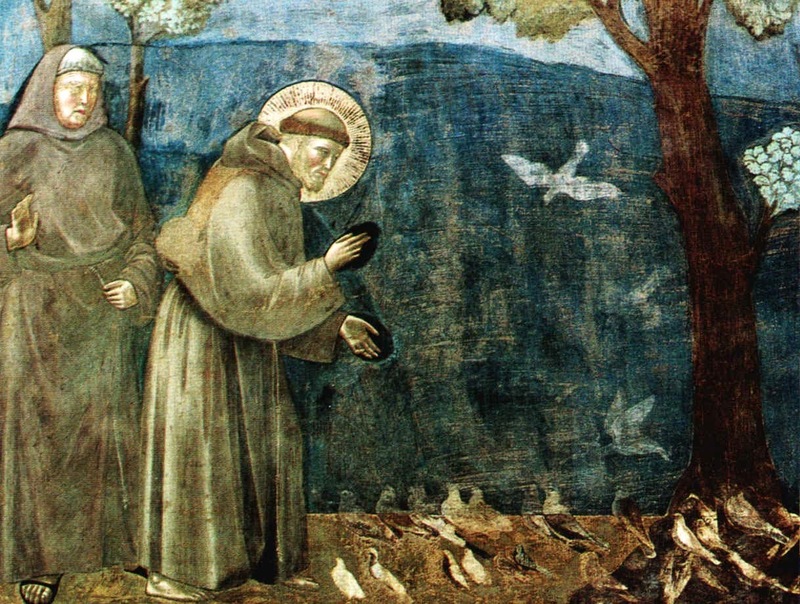 So, too, St. Francis was no stranger to challenging the religious hierarchy, and was clear that his authority came from God. Quite often, when when we see a snapshot of him blessing animals, freeing a city from a wild wolf, or of him preaching to the birds, we are missing out on the larger context. Just as reading the gospel in snippets can leave us unaware of the larger story, the entire story of Francis is life-giving. Francis was deeply enraptured by the Incarnation, by Christ in the World. He saw Christ in all persons, in nature, but also in even those who were poor, those without homes, those on the run, those regarded as unclean by society. Francis surely walked the gorgeous fields around Assisi, and certainly preached to the birds, I have no doubt at all. Likely the birds also preached to him. However, we must expand our thinking about Francis, not merely a concrete statue in a garden, or a latter day spiritual environmentalist. He certainly loved creation, but because it was a visible sign of God’s love for us, of Christ’s embodiment in all things, and of the Holy Spirit all around us. When Francis was told to “repair the church,” he first went to a church ruin, and began literally rebuilding and repairing the church. However, God wanted him to also repair and rebuild, and restore the Church. By his great love for the Trinity, for God in three persons, and for God expressed in the natural world, and in all people, even the poor and neglected, Francis did repair the church. And it still needs repairing.